- `Informal Dictator. Officially he holds no public office or title but is is referred to as "Guide of the First of September Great Revolution of the Socialist People's Libyan Arab Jamahiriya" or "Brotherly Leader and Guide of the Revolution" in government statements and the official press. - Comes from a nomadic Bedouin peasant family in the desert region of Sirte. - Gaddafi began his involvement in conspiratorial politics early during his years in preparatory school in Fezzan from 1956 to 1961. - Inspired on Gamal Abdel Nasser then President of Egypt and his message for Arab unity, Gaddafi and a small group of friends established the core leadership of a militant revolutionary group that eventually seized power in Lybia. - After graduation as a lawyer in the Law School at the University of Libya he entered the Military Academy in Benghazi in 1963 where he and he and a select circle of fellow militants organized a secretive group dedicated to overthrowing the pro-Western Libyan monarchy. - After graduation in 1965 Gaddafi was sent to the Royal Military Academy in Sandhurst, Great Britain returning to Lybia in 1966 as a commissioned officer in the Signal Corps. - On September 1, 1969, a small group of military officers led by Gaddafi staged a coup d'état against King Idris I, while he was in Turkey for medical treatment. - Unlike other military dictators, Gaddafi did not promote himself to the rank of general upon seizing power, but rather accepted a ceremonial promotion from captain to colonel and has remained at this rank for the last thirty-seven years. - His new regime was a blend of Arab nationalism, aspects of the welfare state and what Gaddafi termed "direct, popular democracy." - He called this system "Islamic socialism" and while he permitted private control over small companies, the government controlled the larger ones. Welfare, "liberation" and education were emphasized. - Based on his ``Green Book`` published in 1976 Gaddafi imposed aystem of Islamic morals, outlawing alcohol and gambling to reinforce the ideals of this socialist-Islamic state. - Gaddafi`s form of government utilizes systematic terror as he has responded and responds to domestic and external opposition with violence. - Thorough his `Revolutionary Committees` Gaddafi called for the assassination of Libyan dissidents living abroad in February 1980, with Libyan hit squads sent abroad to murder them. - After Nasser`s death on September 28, 1970, Gaddafi attempted to take up the mantle of ideological leader of Arab nationalism by proclaiming the "Federation of Arab Republics" (Libya, Egypt and Syria) in 1972, hoping to create a pan-Arab state, but the three countries disagreed on the specific terms of the merger. - In 1974 he signed n agreement with Tunisia's Habib Bourguiba on a merger between the two countries, but it failed. - Gaddafi became a strong supporter of the Palestine Liberation Organization, which ultimately harmed Libya's relations with Egypt when in 1979 Egypt pursued a peace agreement with Israel. - As Libya's relations with Egypt worsened, Gaddafi sought closer relations with the Soviet Union. Libya became the first country outside the Soviet bloc to receive the supersonic MiG-25 combat fighters, but Soviet-Libyan relations remained relatively distant. 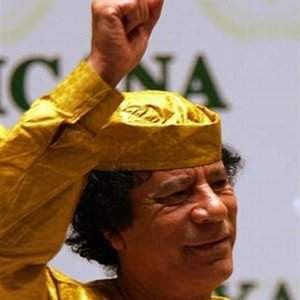 - Notable in his open support for liberation movements, in most cases Muslim groups, by the 1970s Gaddafi`s regime won a reputation for ubversion and terrorist activities in both Arab and non-Arab countries. - By the mid-1980s, he was widely regarded in the West as the principal financier of international terrorism. 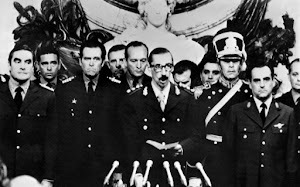 - The west has accused Gaddafi as been the major financier of the "Black September Movement" which perpetrated the Munich massacre at the 1972 Summer Olympics, and was accused by the United States of being responsible for direct control of the 1986 Berlin discotheque bombing that killed three people and wounded more than 200, of which a substantial number were U.S. servicemen. He is also said to have paid "Carlos the Jackal" to kidnap and then release a number of the Saudi Arabian and Iranian oil ministers. - Tensions between the United States and Lybia reached a peak during the Ronald Reagan administration, which tried to overthrow Gaddafi. - he Reagan administration saw Libya as an unacceptable player on the international stage because of its uncompromising stance on Palestinian independence, its support for revolutionary Iran in its 1980-1988 war against Saddam Hussein's Iraq (see Iran-Iraq War), and its backing for "liberation movements" in the developing world. In March 1982 the U.S. declared a ban on the import of Libyan oil and the export to Libya of US oil industry technology; Europe did not follow suit. - Libya's involvement with and support for terrorism were confirmed in late 1987 when a merchant vessel, the MV Eksund, was intercepted. Destined for the IRA, a large consignment of arms and explosives supplied by Libya was recovered from the Eksund. - For most of the 1990s, Libya endured economic sanctions and diplomatic isolation as a result of Gaddafi's refusal to allow the extradition to the United States or Britain of two Libyans accused of planting a bomb on Pan Am Flight 103 over Lockerbie, Scotland. - In August 2003, two years after Abdelbaset Ali Mohmed Al Megrahi's conviction, Libya formally accepted responsibility for the Lockerbie bombing. 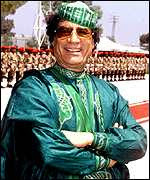 Gaddafi agreed to pay compensation of up to $2.7 billion – or up to $10 million each – to the families of the 270 victims. - From the mid-1990s, Gaddafi managed to improve his connections among Middle Eastern nations and is today considered by some a more moderate and responsible leader in the Arab world than previously. Regarding the Palestinians, he has begun pushing the concept of a binational single-state solution – "Isratine" – a combination of the words Israel and Palestine. 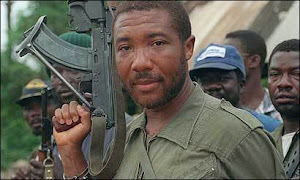 - Simultaneously, Gaddafi has also emerged as a popular African leader. As one of the continent's longest-serving, post-colonial heads of state, the Libyan dictator enjoys a reputation among many Africans as an experienced and wise statesman who has been at the forefront of many struggles over the years. - Gaddafi also appeared to be attempting to improve his image in the West. Two years prior to the terrorist attacks of September 11, 2001, Libya pledged its commitment to fighting Al-Qaeda and offered to open up its weapons program to international inspection. -There are many explanations for the change of Gaddafi's politics. The most obvious is that the once very rich Libya became much less wealthy as oil prices dropped significantly during the 1990's. Since then, Gaddafi has tended to need other countries more than before and hasn't been able to dole out foreign aid as he once did. - On May 15, 2006, the US State Department announced that it would restore full diplomatic relations with Libya, even after Gaddafi declared Libya's weapons of mass destruction programs. - In October 1993, there was an unsuccessful assassination attempt on Gaddafi by elements of the Libyan army. Eight months later, Libyan troops were withdrawn from Chad thus ending a territorial dispute which dated back to 1973. - Gaddafi has eight children, seven of them sons. 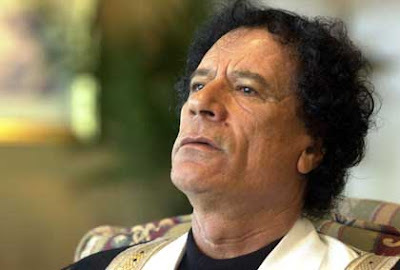 - His oldest son, Muhammad Gaddafi runs the Libyan Olympic Committee. - The next eldest Al-Saadi Gaddafi, runs the Libyan Football Federation, plays for Italian Serie A team Udinese Calcio, and produces films. - The third eldest, Saif al-Islam Gaddafi, a painter, runs a charity which has been involved in negotiating freedom for hostages taken by Islamic militants, especially in the Philippines. - His only daughter is Ayesha Gaddafi, a lawyer who has joined the defense team of former Iraqi leader Saddam Hussein. - In January 2002, Gaddafi purchased a 7.5% share of Italian football club Juventus for USD 21 million, through Lafico ("Libyan Arab Foreign Investment Company"). - Though Gaddafi is an avid football fan, this more importantly continued a longstanding association with the late Gianni Agnelli, the primary investor in Fiat. Gaddafi has also become involved in chess: in March 2004, FIDE, the game's world governing body, announced that he would be providing prize money for the World Championship, held in June-July 2004 in Tripoli. - In November 2002, he hosted the Miss Net World beauty pageant, a first for Libya and as far as is known, the world's first to be held on the internet. - Gaddafi's personal bodyguard, the Amazonian guard, is composed of beautiful African women who are martial arts experts and highly-trained in the use of weapons. The Amazonian guard accompanied him on his 2004 visit to Brussels. - Many trials, particularly those before the State Security Court, still fail to meet international due process standards. - Unjustified limits on free expression and association remain the norm, including penal code provisions that criminalize "insulting public officials" or "opposing the ideology of the Revolution." - Freedom of expression remains severely restricted by the Libyan penal code. - There is no freedom of association in Libya because the concept of an independent civil society goes directly against Gaddafi’s theory of governance by the masses. - Law 19, "On Associations," requires a political body to approve all nongovernmental organizations, does not allow appeals against negative decisions and provides for continuous governmental interference in the running of the organization. - The Internal Security Agency retains full control over two prisons in Libya, Abu Salim and Ain Zara, which are notorious for the arbitrary detention of political prisoners. - In late June 1996 an estimated 1200 prisoners were killed in Tripoli’s Abu Salim prison. For years the authorities denied this had taken place. Until late 2008, the vast majority of the families of the prisoners who were killed had received no information about them. - Throughout the 1970s and 1980s, police and security forces arrested hundreds of Libyans who opposed, or who the authorities feared could oppose, the new system. Authorities labeled critics “stray dogs” and rounded up academics, lawyers, students, journalists, Trotskyists, communists, members of the Muslim Brotherhood and others considered “enemies of the revolution,” imprisoning or subjecting them to enforced disappearance. 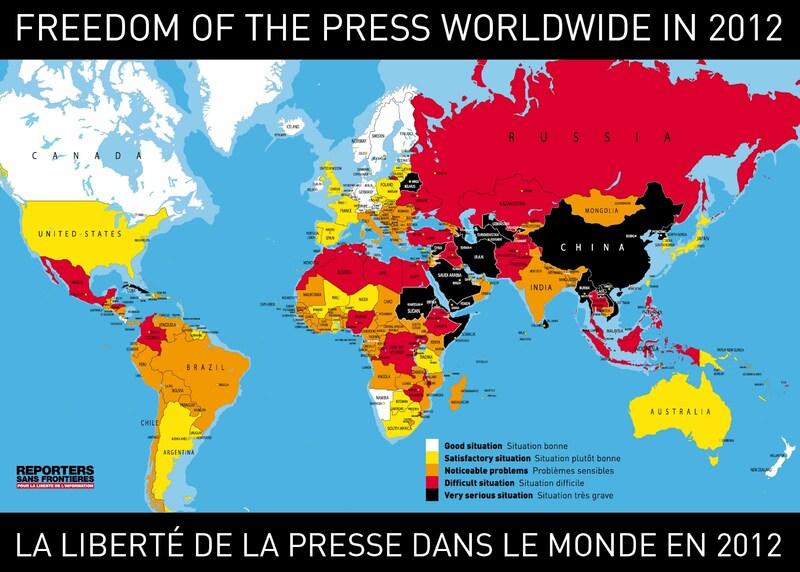 - The past five years have witnessed a gradual opening of a new, still vulnerable but nevertheless measurable, space for freedom of expression. The government retains control over most of the media in Libya and monitors and censors the new private media. - These changes have occurred in spite of the continued repressive legal framework and take on more significance when viewed in that context because journalists take significant risks by writing critically of government policies and abuses. The 1969 Constitutional Proclamation on December which guaranteed some rights, such as the right to work, health care and education, provides for freedom of opinion only “within the limits of public interest and the principles of the Revolution. - Article 207 imposes the death penalty for “whoever spreads within the country, by whatever means, theories or principles aiming to change the basic principles of the Constitution or the fundamental structures of the social system or to overthrow the state’s political, social or economic structures or destroy any of the fundamental structures of the social system using violence, terrorism or any other unlawful means.” There are still political prisoners imprisoned under these provisions which criminalize free speech, such as the case of Abdelnasser al-Rabbasi discussed below in Section VII.